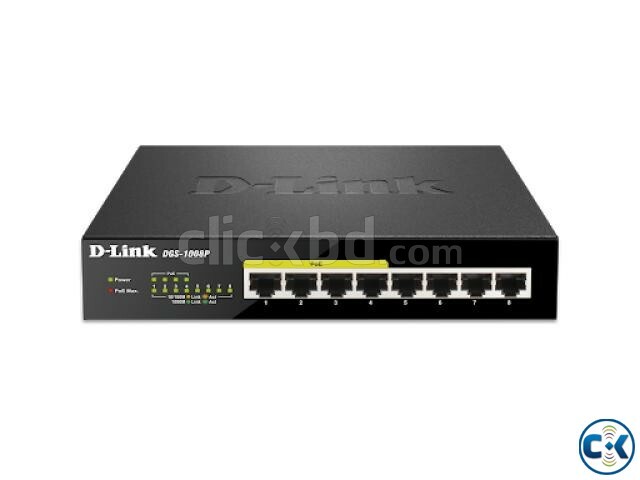 Overview The DGS-1008P 8-Port Gigabit Unmanaged Desktop Switch with 4 PoE Ports enables office users to easily connect and supply power to Power over Ethernet (PoE) devices such as IP cameras, IP phones, and wireless access points (APs). The eight Gigabit ports provide connectivity for devices and applications that require high speed network access, and reduce bottlenecks that can interrupt communication. The DGS-1008P switch can also connect to additional Ethernet devices like computers, printers, and Network Attached Storage (NAS). This compact PoE switch operates silently, making it ideal for use in virtually any room or office. Power Over Ethernet (PoE) The first four ports of the switch support the IEEE 802.3af PoE and 802.3at PoE+ standards. Each of these four ports can supply up to 30 W for a total PoE budget of 68 W, allowing users to attach multiple IEEE 802.3af/at compliant devices to the switch. Use PoE for applications that are far from power outlets, or to minimize the clutter of extra cables. When an end-device is not PoE-compatible, the D-Link DPE-301GS PoE Splitter may be used to split DC power from the data signal at the end device.